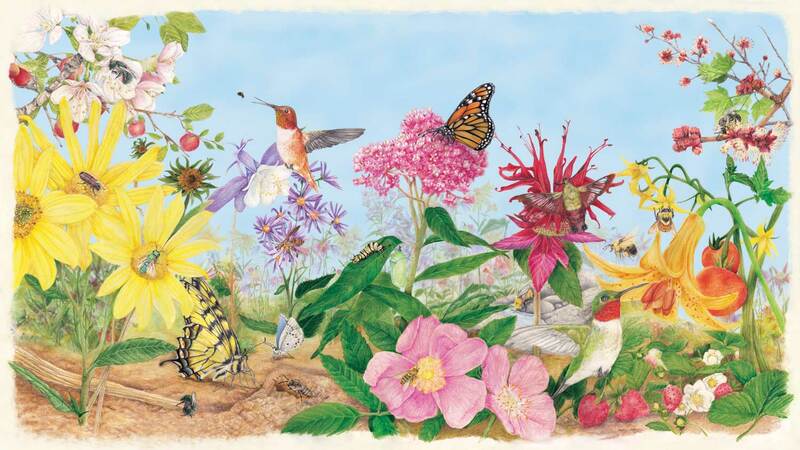 We invite you to explore our Canadian pollinators and some of the native plants they frequent in this interactive "Wild About Pollinator" Poster! Native to most of British Columbia, southern Yukon and western Alberta. Flies and spiders are a source of protein and fat for hummingbirds, like this male rufous hummingbird shown near the wild columbine whose flowers provide carbohydrates. With their long tongues, they prefer trumpet or bell-shaped flowers, large or small. Although they don’t eat much pollen, Canada’s hummingbirds help transfer any that gets on their upper body as they move from flower to flower. Native from Alberta to Nova Scotia. Like this male ruby-throated at a Canada lily, hummingbirds drink nectar from tubular flowers. Although they don’t eat much pollen, Canada’s hummingbirds help transfer any that gets on their upper body as they move from flower to flower. They also drink tree sap from holes drilled by sapsuckers. Their nests are typically made of soft plant material on the inside and lichen, moss and tree bark on the outside to blend in, held together with spider webs. Native to all provinces and territories. This insect is “mudpuddling” to get nutrients from damp earth. You may also see them on low-growing flowers in moist areas in a variety of habitats. They drink from blooms with open or deep flowers. Their pollination services come into play as pollen gets on their legs and body when they land and drink, helping the transfer of pollen from flower to flower. As caterpillars, they provide ants with a sweet liquid secreted from their skin. The ants, in turn, protect the caterpillars from predators and parasites. Native to Yukon and British Columbia to Newfoundland. 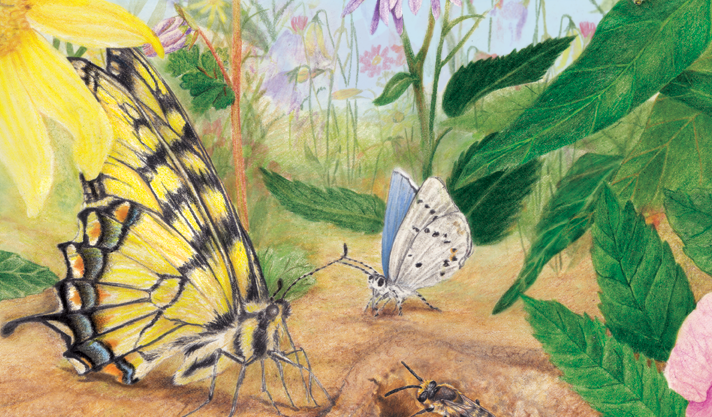 Butterflies, like this yellow and black swallowtail, drink with their proboscises – long, thin, coiled mouthparts common to butterflies and moths. The proboscis is coiled up in between feedings. These butterflies drink from blooms with open or deep flowers. Their pollination services come into play as pollen gets on their legs and body when they land and drink, helping the transfer of pollen from flower to flower. As caterpillars, they feed on leaves of cherry, willow and ash trees, among others. Native from British Columbia to Newfoundland. Adult monarchs feed on all sorts of flowers, but they only lay their eggs on milkweed. This swamp milkweed is one of 14 species native to Canada, including common milkweed. If you look closely, you will spot a monarch caterpillar and chrysalis (cocoon) nearby. They drink from blooms with open or deep flowers. Their pollination services come into play as pollen gets on their legs and body when they land and drink, helping the transfer of pollen from flower to flower. Monarchs and other pollinators need your help. Often mistaken for hummingbirds, these neat moths pollinate a variety of flowers, like this native bee balm. They drink nectar from blooms with open or deep flowers and pollinate many of them from the pollen that gets caught on their upper body. As fully grown caterpillars, they burrow in the leaf litter to make a cocoon, emerging soon after or waiting until the following spring. Native species are found across Canada. Social vespid wasps including paper wasps, hornets and yellow jackets are often feared because they can be defensive when their nest is threatened, and can inflict many painful stings. However, they are not always aggressive. Watch for them calmly sipping nectar from flowers, like this paper wasp on a wild purple aster. Pollination occurs as a wasp travels from flower to flower to drink nectar – pollen gets transferred from its legs and body. Native species are found across southern Canada. These bees are beautifully coloured, like this green sweat bee on a native sunflower. Most have a metallic blue or green upper body with a black and yellow striped lower body; some females are metallic all -over. Due to their appearance and colour, these fast-flying creatures are sometimes mistaken for flies or wasps. They pollinate as they move from flower to flower to sip nectar with their short tongues and gather pollen on special hairs on their hind legs, called scopae. Mason bees are important pollinators to fruit tree crops, such as apples. They are easily attracted to artificial nesting sites such as wooden blocks with holes drilled in them; they are often managed this way in orchards. They nest alone in long, narrow spaces like hollow plant stems. They lay several eggs, each in its own chamber, with walls made from mud or chewed leaves. Offspring may overwinter in these chambers and emerge as adults the following spring. They pollinate as they move from flower to flower to drink nectar and collect pollen on specialized hairs (scopae) beneath the abdomen. Of all Canada’s bees, the most recognizable are large, fuzzy bumblebees. They are important for pollinating some popular food crops, like tomatoes and strawberries, as well as many native plants that grow in the wild or in your garden. They pollinate as they move from flower to flower to collect pollen and nectar in “baskets” made of long hairs curved inward toward the body on the hind legs. Polyester bees line their nests with a cellophane-like secretion using their unique two-lobe tipped tongue. This secretion helps protect the developing bees from fungal disease and acts as a waterproof barrier. It is so effective that ground-nesting species can occupy areas prone to flooding. They pollinate as they move from flower to flower to collect nectar and pollen on hairs located on the top part of their hind legs and thorax (mid-section). These bees are among the first to become active in spring. They look for early blooming plants like red maple to fill their nests with pollen for developing offspring. Bees in the genus Colletes more commonly visit red maple, and while Andrena species visit red maple, they are also partial to willow catkins. Don’t worry if you notice these bees nesting in your lawn; their stinger isn’t strong enough to puncture human skin. They pollinate as they move from flower to flower to collect nectar and pollen on large hairs (scopae) on the top half of their hind legs. It looks as though they’re carrying pollen in their armpits. The adult hover fly, also called the flower fly or syrphid fly, consumes nectar or pollen from plants like wild roses to fuel their energy needs, while their larvae prey on aphids. They transfer pollen that sticks to their bodies as they travel from flower to flower. The adults are easy to spot with their yellow and black stripes that mimic the warning colours of wasps and bees. While adult checkered beetles feed on pollen from plants like sunflowers, most beetles in this family have predacious larvae that develop in bee, grasshopper and wood-boring-insect nests. Pollen is transferred by sticking to their bodies when they land on open flowers. Apple trees have pretty, sweet smelling, white and pale pink flowers that bloom in the spring. These flowers are important to bees, flies and some butterflies that use apple nectar and/or pollen for food. When you next enjoy a juicy, nourishing apple, think of our small but helpful pollinators. While only native to a small part of Canada, this species and its cousin, wild bergamot, is useful for all types of pollinators (bees, butterflies, hummingbirds, wasps, flies, moths and beetles). Columbines are great for hummingbirds and Canada is home to several species. They are also food for bees, whose smaller tongues can reach the shorter-spurred species of columbines. Bees are also known to eat their way through the flower where the spur contains nectar. This pretty blue and white species of columbine grows in the north and west of Canada, as far east as Ontario. Native Canadian lilies are great for attracting hummingbirds and even butterflies, which are able to reach nectar with their long tongue (proboscis, in the case of the butterfly). Bees are also known to take pollen from these flowers. Sunflowers provide a great landing spot for pollinating species such as flies, beetles, bees and wasps, as well as attracting butterflies and moths. Canada is home to many native perennial species, which bloom at various times of the summer and autumn. Asters grow across Canada and are a wonderful food source for bees, butterflies, flies, wasps, moths and beetles in the late summer and autumn. This early spring blooming tree attracts bees, which are eager for a food source at this time of year. Canada’s wild roses are as beneficial as they are beautiful. Rose bushes often have the healthy hum of busily feeding bees with some flies and beetles also joining in. There are cultivated and wild species of this plant in Canada, all of which rely on our pollinators including bees, butterflies, wasps, flies and moths. So whether you pick strawberries at a local farm or in your garden or buy them off the supermarket shelf, take a moment to thank our pollinators. All of Canada’s milkweeds are extremely important to the survival of the monarch butterfly. This popular crop grown in gardens and on farms comes to us courtesy of nature’s forces, including bees!